The combination of Time-Sensitive Networking and OPC UA provides easy access to data from machines, controllers and I/O, regardless of who built the individual devices. With its information models, OPC UA also transmits not just data, but information that can be correctly interpreted by any node on the network. THERE′S NO DENYING THE VALUE that the Industrial IoT holds in store for the future of manufacturing. Efforts to tap into this potential, however, have far only begun to scratch the surface. Operators of industrial machinery and equipment can use the combination of TSN and OPC UA, and no longer have to worry that the simple act of selecting a communication technology will lock them in with a specific vendor. Now, spurred by demand from end customers, automation suppliers are poised to clear the first hurdle on the road to Industrial IoT solutions: seamless communication based on open standards. 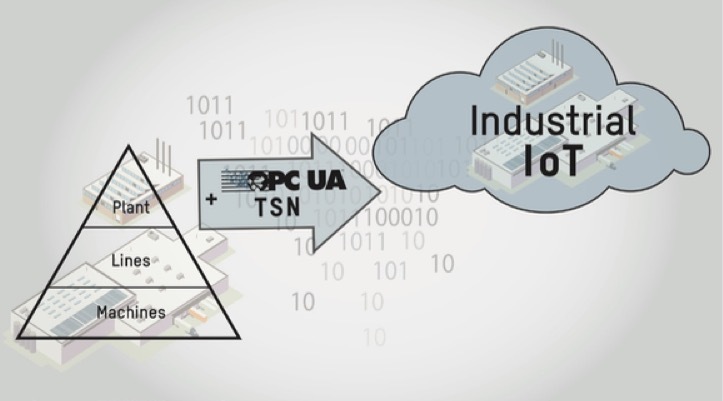 Time-Sensitive Networking (TSN) in combination with OPC UA provides unimpeded access to data from machines, controllers and I/O systems, regardless of who built the individual devices. As an open communications architecture, OPC UA has already found widespread use in a diverse range of industrial applications. Nearly all manufacturers offer OPC UA in their controllers and other products. OPC UA is developed and promoted by many different manufacturers under the oversight of the OPC Foundation. Operators of machinery and equipment no longer have to worry that the simple act of selecting a communication technology will lock them in with a specific vendor. Establishing this type of uniform system connectivity opens up challenges and opportunities for differentiation at a whole new level. Where we′ve been accustomed to seeing 30 or 40 nodes in a network, we′ll eventually be seeing 1,000 or more. The challenge will be to find a way to manage and control this increased number of nodes effectively. Within this challenge, however, lies an opportunity for automation suppliers to differentiate themselves by offering their customers added value. Software tools that streamline the setup and configuration of complex networks with large numbers of nodes will become substantially more important. These tools will also need to be designed for users without extensive IT training. It′s not only the number of nodes that is increasing so rapidly, however; the volume of data will also continue to grow exponentially. Managing the flood of big data with conventional industrial protocols is becoming increasingly difficult, and this is where OPC UA promises substantial improvement. Among the greatest advantages of OPC UA are its information models. Traditional bus systems transmit dimensionless data - simple numbers unaccompanied by units or any other information. The application running on the controller knows how to interpret these numbers using what is known as a semantic data model. There is absolutely nothing wrong with this approach, of course, as long as machines are operating independently of one another. However, as soon as it becomes necessary to use the data elsewhere - be it on other machines, in SCADA systems or even in cloud-based ERP systems. The semantic meaning is lost, and all that remains are the dimensionless numbers. In the past, the semantic context has been transmitted to other systems in lengthy tables or even in handwritten form. This painstakingly tedious undertaking - a notorious source of errors - is eliminated entirely with OPC UA, making it considerably easier to implement more agile and responsive manufacturing solutions. With its information models, OPC UA transmits not just data, but information that can be correctly interpreted by any node on the network without any further explanation. Say, for example, we have a sensor that measures a temperature of 5°C. Coming from a traditional protocol, the controller would receive this as an integer data type with the value "5". The fact that the number represents a temperature value measured in degrees Celsius, and the fact that there are certain limits to be applied, is de ned in the application running on the controller. OPC UA takes a different approach. The value "5" is provided along with all of its semantic context. In this case, it is a temperature value measured in degrees Celsius, and it has limit values that should be applied. Since other nodes on the OPC UA network are able to query this information, it can be used in a much wider variety of ways. If you want to generate a new ERP report, for example, the ERP system can browse the network for appropriate information. Once found, this information can be collected in a database and viewed in the report. It used to be necessary to program this data transfer manually, and the semantic information for each individual value would need to be stored in the ERP system. With this static structure, changes to variables on the machine would also require reprogramming in the ERP system. This example highlights just how much OPC UA simplifies communication from the control layer up to higher-level systems. With that, however, we arrive at the next hurdle: When higher-level IT systems are sending queries down into the machine network - referred to in this context as operational technology, or OT - the network load inevitably increases. For an IT computer network, delays in the millisecond range are generally not a big deal to worry about. For a precisely synchronized manufacturing process, on the other hand, sub-millisecond accuracy is absolutely essential. Here, a delay in the millisecond range can shut down a machine, reduce output quality or even cause significant harm to equipment and personnel. This is why nearly every manufacturing facility has traditionally maintained a clear separation between its IT and OT networks. IT networks have historically lacked determinism and cyclic data traffic - two deal breakers at the OT level. IT networks follow a principle known as "best- effort delivery", which means that data packets all share the same level of priority and are transmitted as quickly as possible. If capacity is exceeded at any point in the process, there will be a bottleneck and interruption of timing which is something that cannot be permitted on a machine network. Until now, there has been no way to implement both best-effort and deterministic cyclic traffic on the same infrastructure. With Time-Sensitive Networking (TSN), that′s about to change. TSN is a group of extensions to the Ethernet standard that will allow both general and time-critical data to be transferred over the same network. The rst step toward equipping a network with deterministic behavior is to ensure all of its nodes are on the same page with regard to timing. The IEEE 802.1 AS-Rev standard was developed for this purpose. It describes a mechanism for synchronizing the clocks of all the nodes in the network to establish a uniform network time. The next step is to guarantee that deterministic data traffic is given priority on the network. This is covered by the standards IEEE802.1 Qbv and Qba, which specify that network switches must operate in such a way that deterministic data traffic is transmitted within a guaranteed time frame, even if this means that other traffic must wait. To establish a uniform approach to configuring this type of network, the Stream Reservation Protocol (IEEE802.1Qcc) provides standardized interfaces and mechanisms for configuration. Until now, there has been no way to implement both best-effort and deterministic cyclic traffic on the same network. With Time-Sensitive Networking (TSN), that′s about to change. TSN provides a group of extensions to the Ethernet standard that will allow both general and time-critical data to be transferred over the same network. If you combine the mechanisms described above in a network, it becomes possible to transmit time-critical and cyclic data on the same physical layer as non-time-critical data. Since modern production networks rely on Gigabit Ethernet transfer rates or higher, this simultaneously resolves the bandwidth bottleneck issue that currently plagues not only fieldbus systems, but industrial Ethernet protocols as well. The combination of OPC UA and Time Sensitive Networking will set the stage for entirely new industrial automation architectures. One of the most notable features of these new designs will be increasingly blurred lines between IT and OT networks. This applies not only to new plants built with full connectivity from the ground up, but brown eld plants as well. OPC UA TSN covers all the requirements of today′s most demanding manufacturing applications above the control layer. Sebastian Sachse, Dipl. Ing. at B&R Industrial Automation GmbH.